Parliament voted Tuesday to send May back to Brussels to renegotiate the terms of the Brexit deal over concerns over the Northern Ireland backstop. But European leaders ruled out renegotiating the terms of the Withdrawal Agreement or the backstop, an insurance policy designed to prevent a hard border with Ireland. UK lawmakers also passed a non-binding amendment that rules out a no-deal Brexit, in a symbolic defeat for the government. The clock is ticking -- Tuesday marks two months until Britain is due to leave the EU on March 29. So now we know: Theresa May will go back to Brussels and plea for meaningful changes to the Northern Ireland backstop. If she can get concessions from the EU, then it looks like we have a deal. But the EU has been utterly consistent in its position that the Withdrawal Agreement is not open for renegotiation. That means the backstop cannot be tweaked. So it's starting to look a lot like a showdown: May's deal versus no deal. But didn't lawmakers just vote to rule out a no deal? They did. But it's not legally binding, and even if it were, it simply is not in the gift of Parliament to rip up an international treaty. So May's deal, no deal, or something else? Goodness me. All eyes on Brussels; all eyes on opposition leader Jeremy Corbyn. The British Chambers of Commerce and the British Property Federation have both bemoaned Tuesday's Parliamentary vote, stressing that the UK leaving the EU without a deal is the worst possible outcome for British businesses. A number of industry leaders have warned of economic chaos and food shortages in the event of a no-deal Brexit. "Another day lost while the clock is ticking," Adam Marshall, the BCC Director General, said. "The real-world result of Westminster’s interminable wrangling is market uncertainty, stockpiling, and the diversion of staff, money and investment." CEO of the British Property Federation, Melanie Leech, issued a plea for the government to come together. “The property sector stands united with other business sectors in stressing that a No Deal is the worst outcome – but we need a clear alternative to provide the clarity on which investment decisions today, for the long-term health of the UK, can be based," Leech said, adding that the current Withdrawal Agreement was the only credible option. Irish Prime Minister Leo Varadkar has said there can be no substitute for the backstop. The Withdrawal Agreement is not open for renegotiation, the Irish government said in a statement Tuesday shortly after the British Parliament voted to “require” that alternative arrangements to the Northern Ireland backstop be put in place. “The agreement is a carefully negotiated compromise, which balances the UK position on customs and the single market with avoiding a hard border and protecting the integrity of the EU customs union and single market,” Ireland said. European Council: "Withdrawal Agreement is not open for re-negotiation"
May and Tusk in slightly happier times, during an EU summit in Brussels in October 2017. A spokesman for Donald Tusk, the President of the European Council, told CNN that the UK's Withdrawal Agreement is not open for renegotiation, despite Parliament's vote Tuesday night to do just that. ���The Withdrawal Agreement is not open for renegotiation,” the spokesman said, minutes after Parliament voted to say it “requires the Northern Ireland backstop to be replaced with alternative arrangements” in order to agree to Theresa May's deal. We welcome and share the UK Parliament's ambition to avoid a no-deal scenario. We continue to urge the UK government to clarify its intentions with respect to its next steps as soon as possible. The Withdrawal Agreement is and remains the best and only way to ensure an orderly withdrawal of the United Kingdom from the European Union. The backstop is part of the Withdrawal Agreement, and the Withdrawal Agreement is not open for renegotiation. The December European Council Conclusions are very clear on this point. If the UK's intentions for the future partnership were to evolve, the EU would be prepared to reconsider its offer and adjust the content and the level of ambition of the political declaration, whilst respecting its established principles. Should there be a UK reasoned request for an extension, the EU27 would stand ready to consider it and decide by unanimity. The EU27 will adopt this decision, taking into account the reasons for and duration of a possible extension, as well as the need to ensure the functioning of the EU institutions. We will continue our preparations for all outcomes, including a no-deal scenario. We will also continue the EU´s process of ratification of the agreement reached with the UK government. President Tusk will stay in close contact with EU27 leaders. Speaking after lawmakers backed a move to reopen negotiations with the EU over the Northern Ireland backstop, Prime Minister Theresa May said that it was now "clear that there is a route that can secure a substantial and sustainable majority in this House for leaving the EU with a deal." May said she would now seek to deal with concerns -- primarily from the rightwing of her own Conservative party -- over the backstop, an insurance policy in the withdrawal deal to avoid a hard border between Ireland (which is in the EU) and Northern Ireland after Brexit. "There is limited appetite for such a change in the EU and negotiating it will not be easy," May said, triggering a round of jeers from the House of Commons. "But in contrast to a fortnight ago, this House has made clear what it needs to approve a Withdrawal Agreement." Reiterating her stance on no-deal, May added that simply opposing an exit from the EU without a deal is not enough to stop it, but underlined that the government would redouble its efforts to achieve a deal Parliament could support. After weeks of refusing to hold talks with the Prime Minister, opposition leader Jeremy Corbyn said that his Labour party was now prepared to meet May to outline the kind of agreement that it wants with the European Union. Scottish National Party MP Ian Blackford, who earlier proposed a "stop the clock" amendment on Brexit that was soundly defeated, shouted repeatedly that the Brady vote "effectively ripped apart the Good Friday Agreement." The Good Friday Agreement, signed in 1998, helped end years of deadly sectarian violence and paved the way for the removal of border posts on the frontier between Ireland and Northern Ireland. Nigel Dodds, the Deputy Leader of Northern Ireland's Democratic Unionist Party, retorted that the vote to renegotiate the deal and the backstop did not "drive a coach and horses" through the historic peace agreement, adding that it is "utterly reckless to talk in those terms." Graham Brady, who proposed the amendment to reopen negotiations on the backstop. European officials have repeatedly said they will not reopen the withdrawal deal, which was was agreed between May and Brussels last year before Parliament roundly rejected her deal earlier this month. Not much in this debate has garnered consensus, but when it comes to a no-deal Brexit, lawmakers have largely agreed that they don't want the UK crash out of the EU without a parachute. An advisory amendment pushing to remove the option of the UK leaving the EU without a deal, tabled by Conservative MP Caroline Spelman and Labour MP Jack Dromey, was approved by lawmakers on Tuesday 318 to 310. The passage of the amendment is a symbolic defeat for the government and for no-deal Brexit. Why are Brexit hardliners helping May tonight? There have been whispers in Westminster for some time that the more hardline Brexiteers are agitating for a no-deal outcome. They hate Theresa May's deal, but are lending her their support tonight. Why? A theory: with Cooper's amendment failing, meaning that Parliament has recorded no majority for extending Article 50, no deal is back on the table in a big way. As things stand, the conversation has shifted in an instant back to May's deal versus no deal. Only a fool would try to predict which of these would be more likely to happen, but remember this: no deal is still the default and it could still happen. An amendment that sought a two-year extension of Article 50, led by Labour MP Rachel Reeves, was rejected 322 to 290, with a majority of 32. The amendment called for an extension if no agreement had been reached by February 26, 2019. While it was similar in scope to the Cooper amendment in that it also sought to secure an extension to avoid a no-deal scenario, this amendment would have been by political force rather than requirement. 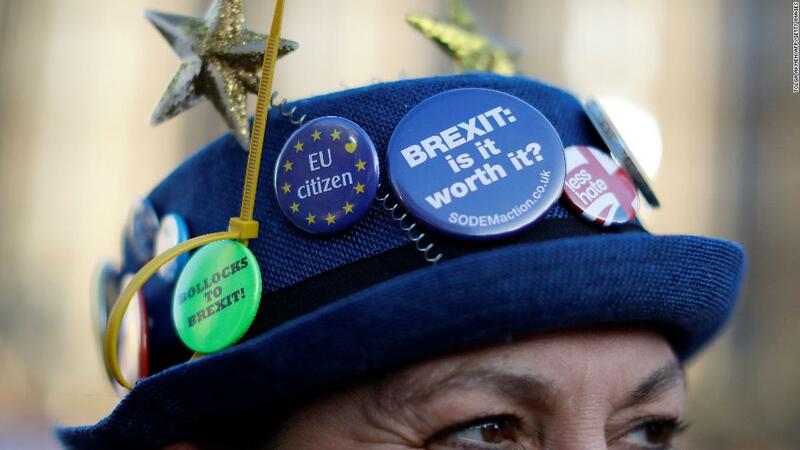 Without Parliamentary appetite for an Article 50 extension, no-deal being the default puts Theresa May's deal or no-deal ultimatum front and center, CNN's Luke McGee says.